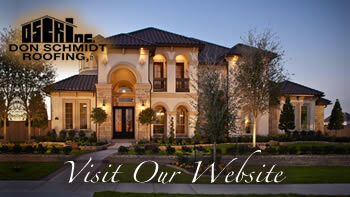 Home » Don Schmidt Roofing Blog » Answers to a Few Questions that Typically Arise about Roofing Installation & Repair. Whether you have been planning on replacing your existing roof system or installing a new roof system on a structure you are currently, Don Schmidt Roofing and Contracting is able to professionally and reliably manage the repair or new installation. We have taken the time to answer a few questions that typically arise about roofing repair and installation in the Central Florida region. My roof is leaking. What are choices I have now to remedy this? Leaking can result from damage to a section of the roof or from flashing coming loose. Depending on the situation, we can patch the roof, recover the roof with new roofing material (also called re-roof), or replace the roofing system. What are the costs of a new roof? Pricing of a new roof all depends on the type of material you select, whether you remove the old roof, the type of underlayment, the price of the permit and the complexity of the roof and of the job site. How long does it take to replace a roof? Re-roof or new construction depends on the type of roof, the weather and the inspections needed. Generally, for a family home of 1,500 square feet it can take a few days. Don Schmidt Roofing and Contracting works to keep your hassles to minimum with re-roofing. What affects my roof’s performance? Sun and intense wind and rain are what affects your roofing system the most. Central Florida’s sun with its heat and ultraviolet rays cause roofing materials to deteriorate at a swifter rate than many other areas in our nation. Deterioration can occur faster on the sides facing west or south. When you need your roof inspected, whether it be for your business or your home, and you’re not sure what to do… Give us a call Don Schmidt Roofing would love to earn your trust and help you with your central Florida home/commercial roof repair or installation. Call us at 407.892.9884 today or contact us online at www.DonSchmidtRoofing.com. We are a local family owned business serving central Florida since 1988 and an Osceola county resident since 1959. Put your roofing project into the hands of a contractor you can trust.